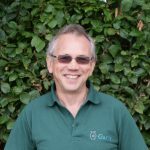 I joined Garth Veterinary Group in 1986 , and subsequently became partner. Over the years I have worked extensively with pigs as well as running the general mixed and small animal sections of the practice in the past, and operating our diagnostics lab Beeford Labs Ltd. Garth was sold in March 2015 to Origin and I have continued to work for the business on an employed basis both as a pig vet and as director with responsibility for the groups pig work. The Origin group now represents by far the largest pig and livestock veterinary practice in the UK. My work is now predominantly pig. I am an official veterinarian and hold many of the export panels. I am actively involved in veterinary societies and was for many years Treasurer of the Pig Veterinary Society. In my private life I am a keen trail runner and enjoy watching wildlife.